ProSolve Consulting Ltd.Manufacturing & Industrial Engineering - ProSolve Consulting Ltd.
Why Manufacturing and Industrial Engineering? Take steps to improve operational processes with the resources you already have. Efficiently produce more products and services with the same staff, space, time and money. ProSolve can reclaim valuable space in your facility by as much as 50%, improve labour efficiency by 15%, and increase the safety of your warehousing operations. Are you running out of space to efficiently store and retrieve your inventory? 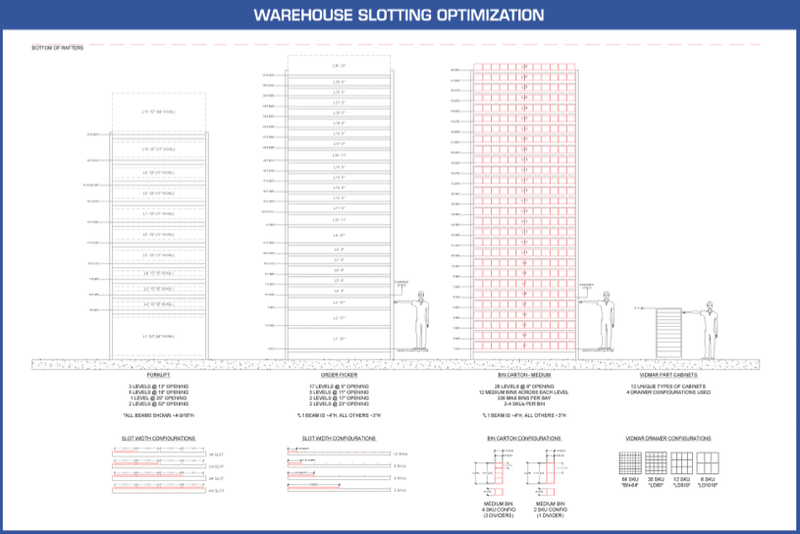 Learn more about slotting and benefits of warehouse optimization. ProSolve develops innovative layout and process improvements that enable clients to extend the lifespan of their existing facilities using lean principles, Systematic Layout Planning (SLP), and industry leading best practices. Determine if your existing facility can be re-designed to accommodate growth plans without the need for more space or expansion. Design an efficient new facility layout specifically optimized for flow, storage, and productivity. Work systematically through a design development process that guarantees excellent results. Ensure specific industry, process, and equipment needs are satisfied. Save unnecessary investment expenses by recommending cost and space saving opportunities. Incorporate Lean concepts that help businesses operate productively and potentially save millions of dollars in capital and / or operating costs. We can model your shop, plant, facility or warehouse process to examine where improvements should occur, without a trial and error approach. You can see your processes in action before you implement changes that will deliver the best results. Process modelling and simulation is a powerful tool that will improve any process in any industry. Using a wide array of Lean and Industrial Engineering methodologies, ProSolve works with you to understand, analyze, and improve your processes, resulting in less waste and increased profitability. You will become more competitive in the marketplace and attract more business when your costs are lower. ProSolve’s Industrial Engineers can work with you to immediately begin optimizing your processes. When you become aware of the need to operate efficiently and effectively, your delivery and transportation of products comes under much more scrutiny. When you provide and / or use transportation services, you must be able to deliver reliably and on time. Optimization of shipping and receiving processes. Considering changes to your processes? ProSolve can help you make the right changes to increase efficiency and profitability.